When the nerves in the ball of the foot becomes irritated a Neuroma can develop. Tight fitting shoes, hard surfaces and putting pressure on the ball of the foot can all irritate the nerve. Symptoms can range from tingling toes(pins and needles), burning or even sharp shooting pain. This usually occurs between the third and fourth toes. 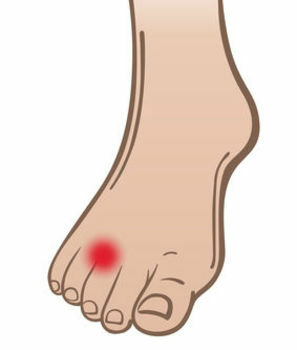 High heels, pivoting hammer toes can put excessive pressure on the ball of the foot and can lead to joint inflammation. The most common joint is at the base of the second toe. There are many reasons for pain in the big toe. Arthritis, gout and bunions can all cause pain. Identifying and diagnosing your condition can lead to a successful treatment and get you back to walking pain free.